Openside flanker Elly Mukaizi landed a brace as KCB rallied from a 3-14 deficit to successfully defend the Impala Floodlit title with a 26-14 final result over hosts Resolution Impala Saracens at the Impala Club on Saturday 31 October 2015. The Sarries started this game with poise and purpose, Nato Simiyu once again treating the fans to bravura rugby, his passionate and intelligent play carving open the KCB defence with the odd shimmy, the change of direction and eventually the weighted pass to scrum half Michael Mugo who was stopped short of the try line. The ensuing pressure saw veteran lock Paul Oimbo go over the whitewash, Sammy Oliech adding the extras to see the home team go 7-0 up. This stung KCB into a response, eating into Impala territory and drawing a penalty off an infringement. Debutant Kenny Andola missed the ensuing goal attempt. The defending champions continued to ask questions of their opponents and drew a second penalty within striking range of the sticks. Darwin Mukidza,taking over the kicking duties from Andola was sure with the goal attempt,his effort cutting the deficit to 7-3. Eric Kerre would land a second try for Impala, bursting through after receiving an excellently timed offload from Sammy Motari after a six phase build up.Oliech was sure with the conversion, his side coasting ahead 14-3. KCB looked dead and buried, but they were not down and out. They finally found their rhythm midway through the first half, surging forward as they started to boss the breakdown and eventually see lots of possession. They drew another infringement off Impala, Mukidza drilling this goal attempt between the sticks to bring the score to 14-6. Mukaizi would score the first of his two tries from a driving maul, Mukidza converting for a 14-13 score at the interval. Mukidza’s successful penalty two minutes into the second half saw the bankers take the lead for the first time, and for the rest of the fixture. It would remain close, the tension between the two sides palpable. Impala were soon struck a blow when Robert Aringo,effective all evening, was sent to the sin bin for ten minutes after an infringement. 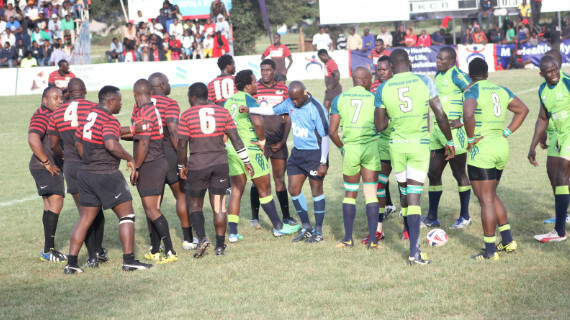 Impala would see plenty of possession, converting some of it into territory but let down by a combination of factors, most notably, indecision and handling errors as well as determined defense from KCB. KCB would absorb the pressure , and found themselves possession, making a rare foray into Impala territory. Kenya Sevens skipper Andrew Amonde would go over the chalk, Mukidza fluffing the conversion as the bankers went into the final quarter of the match 21-14 up. Mukaizi would land his brace, again scoring off a driving maul as the bankers held on for the result, adding to titles in 2005,2007,2013 and 2014. USIU led from gun tape, stopping fancied Strathmore University 30-20 to lift the Impala Floodlit Varsity Category. Laiser Hill successfully defended the schools title with a 24-7 win over Ofafa Jericho.